Sean Stanford thought he was going to die. It happened one week last winter, and started with a pain in his chest. A heart attack, he figured. A trip to the emergency room turned up nothing. There was nothing wrong with him. And then the pain started again, worse this time. Another trip to the emergency room. Another dead end. The crushing pressure in his chest wouldn’t stop. For a week straight, he was in and out of the hospital but he was, by all accounts, a healthy 33-year-old man. But there was something wrong with him after all. He wasn’t having a heart attack. He was having a panic attack. “I almost wish it had been something physical — that would have been easier to deal with,” said Stanford, who farms near Magrath. It’s a story that’s becoming all too familiar in Canada’s agriculture community. The stress of farming is taking a heavy toll on today’s farmers, who are increasingly expected to produce more with less time, money, and support. But this stress often goes undiagnosed, owing to an overburdened rural health-care system and a shocking lack of mental health resources for farmers. A new non-profit organization hopes to change that. 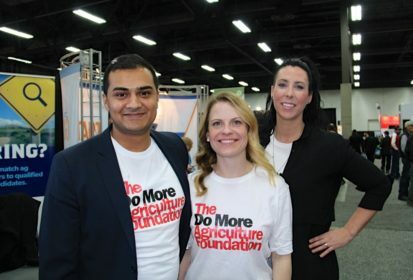 The Do More Agriculture Foundation, which was launched last month, is the first Canadian mental health organization that focuses on resources and support for farmers and their families. Farmers have needed a resource like that for a long time, said Stanford, who had always been a little anxious growing up. At the time, he chalked it up to stress, the normal day-to-day pressure that everyone deals with. It wasn’t until last winter that he realized just how much it was affecting his life and his farm. Farm chores were piling up. Bills were, too. His wife was pregnant with their second child, and his income was the only thing keeping them afloat. He was always behind at his off-farm job as a mechanic and always on call as a volunteer firefighter. Then he injured himself at work, and things got worse from there. For Stanford, that sobering realization only ramped up the pressure. Their success — or failure — as a family and as a farming operation was on his shoulders. “I don’t farm that many acres, so there isn’t a lot of room for error,” said Stanford, who grows 650 acres of both dryland and irrigated crops. As farming becomes more intricate and competitive, farmers like Stanford are forced to choose between this piece of equipment or that piece of rental land; this agronomy or that marketing service. And it all costs money they can’t afford to spend. If they choose to figure it out on their own, like Stanford did, the mental load becomes a weight that’s hard to bear. “Farming is tough no matter what, but I’m starting from scratch and building up to something,” said Stanford, whose operation is separate from his father’s and his brother’s. This is the sort of stress that is literally killing farmers. “Stress for anyone causes more psychological distress, and farming is considered to be one of the most stressful occupations,” said Judi Malone, chief executive officer of the Psychologists Association of Alberta. A study conducted by the University of Guelph found 35 per cent of farmers suffer from depression, 45 per cent from high stress, and 58 per cent from anxiety. In many cases, those illnesses remain undiagnosed. Rural Albertans in general underestimate how serious or widespread mental health problems really are, said Malone, whose research focuses on mental health in rural populations. Up to one-third of people who live in rural areas have moderate to high levels of psychological distress, which can show up as anxiety, depression, substance abuse problems, and even suicidal behaviours. And the ‘stiff upper lip’ farmers pride themselves on is making it harder for them to know when it’s time to seek help. Roughly 40 per cent of farmers in the Guelph study said they would not seek help because of the stigma associated with mental health problems. “They see other farmers struggling and pushing through, so there becomes this belief that they should be able to push through as well,” said Malone. The Do More Agriculture Foundation is hoping to bridge that gap by destigmatizing mental illness in the agriculture industry and offering resources designed specifically for farmers. “Our industry is built on resiliency and perseverance and strength, but talking about mental health can be a big challenge,” said Lesley Rae Kelly, a farmer and co-founder of the Do More Agriculture Foundation. The goal of the foundation is to tear down some of those barriers, said Kim Keller, who co-founded the organization with Kelly, Farm At Hand co-founder Himanshu Singh, and Saskatchewan curler Kirk Muyres. “There’s this idea that if we were to show that emotion or reach out for help, we would be perceived as weak,” said Keller, who farms near Melfort, Sask. Through conversation and community building, the goal of the foundation is to change “the culture of agriculture” to one that is more open about mental health. “We want to get people talking — to get them to ask more and listen more,” said Kelly, who farms near Watrous, Sask. That’s why it’s important for farmers to reach out, Malone added. For Stanford, talking about his problems was hard — but it was the first step toward healing. “The best thing I did was go see my family doctor and be honest with him,” said Stanford. His doctor prescribed medication for his anxiety and referred him to a counsellor, who talked him through his problems. And part of that process was realizing he’s sick — not weak. “Men are supposed to be strong bodied and strong minded, so when you ask for help, it makes you think you’re weak. You’re not weak,” he said. “I don’t feel like I’m weak because I looked for help or shared my story. I do feel like I’m sick, and I feel stronger getting help than I did before.